SlideshowCast is an iOS app that lets you make photo slideshows on iPhone / iPad / iPod touch for casting on bigger TV screen wirelessly. SlideshowCast iPhone iPad app enables you to organize your digital photos from Camera Roll and Photo Library and turn them into video slideshow momentarily with instant preview. 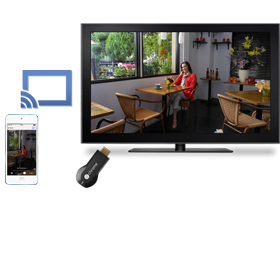 With the help of Chromecast, you are able to stream your slideshow video to wide TV screen via Wi-Fi. While playing the slideshow video on TV, your iPhone / iPad / iPod touch works as a remote control to play, pause, and move forwards and backwards. Apart from casting slideshow on TV through Chromecast, SlideshowCast also lets you save your slideshow video to iPhone / iPad / iPod touch Camera Roll. Besides, it provides a variety of options to customize your slideshow video, like background music, title, watermark, photo editor, transitions, duration, Pan & Zoom, and more. When your slideshow has been encoded, it will be saved as a slideshow project which can be edited like adding/deleting photos, rearranging photo order, customizing, etc. and recreated for best visual experience on TV afterwards. SlideshowCast is available on the iTunes App Store. It works with iPhone, iPad and iPod devices running iOS 7.0 or above. SlideshowCast App lets you turn photos into slideshow video momentarily with instant preview. You can add photos from iPhone / iPad / iPod touch Camera Roll and Photo Library. 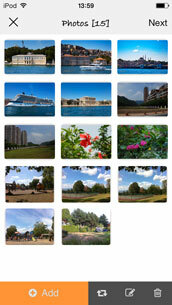 There are options to organize photos, crop photos and edit photos as well. SlideshowCast iPhone iPad App generates photo slideshow video in no time. You are also allowed to add background music, apply transitions, adjust duration, enable Pan & Zoom, insert title and watermark and more. Music trimming is also supported. 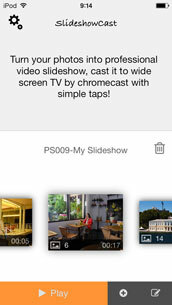 In order to cast slideshow video to TV, the Chromecast device is required. You need to plugin Chromecast to TV and make sure both your iPhone / iPad / iPod touch and Chromecast are connected to the same WiFi network. Then you can feel free to watch your slideshow on big TV screen. There is also a free version of SlideshowCast App. The only difference between the free version and the full version is that the former will attach a watermark logo on the TV screen. In 5 minutes or less I had exactly what I was looking for. Very easy to use and for a novice it's got everything, music integration, transitions. It did everything i wanted.